It’s close to 10 PM. I have been lying in my bed for an hour, resting my aching back, soothing my tired calves, trying to shut my eyes and go to sleep, but it seems futile with that last bit of adrenaline still refusing to leave my mind and body. It is making my fingers dance on my phone as I reply to all the lovely comments and good wishes sent by everyone and keeping my eyelids open just a wee bit to look at all the wonderful photographs uploaded on WhatsApp and Facebook. With so much appreciation and love being bombarded from all directions sleep is a long way away! What’s in a name? 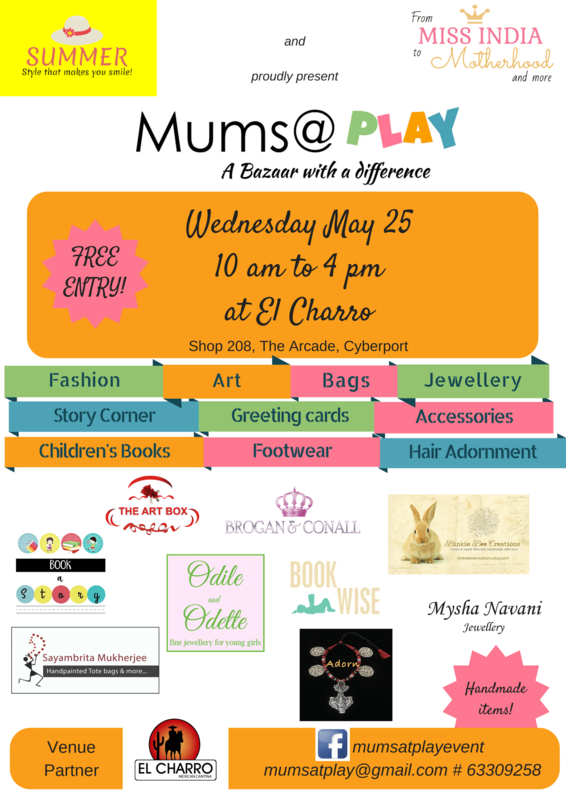 Mums@PLAY – was it just a few weeks ago that I sat at my table, scribbling out different names on my son’s old Math book, for this brand new event that I was planning to organise? MumsRUs..too cliched, Fun with mums…sounds cheesy, MumsinBiz…too boring, so what about Mums at play, Mums@play…..Mums@PLAY using different colours for each capital letter! Yes! This is it! I said it out loud, bounced it in my head, bounced it off my husband and then my bestie sitting in Australia who being a business person herself understands my mind and shares my concern. “It’s a great name Mehroo, go ahead!” was just the kind of thing that I needed to hear to put a seal on the brand name and get me started on the main bulk of things to-do for this first-time bazaar. Hunt for the venue. I started with a list of standard event venues on HK Island that I had downloaded from a website and did a bit of leg work inspecting each, meeting the owner, getting prices and assessing their location vs cost vs “friendliness”- most important for my event, before I narrowed down on El Charro, the Mexican cantina in Cyberport. “Cyberport! Where’s that?” Was the response I got from the first potential vendor who obviously lived quite far from Pokfulam, but I wasn’t surprised. I didn’t know her part of town too. All I knew was that this is HK, it is smaller compared to most cities, people here have a zest for life, a penchant to socialise, and if you create a buzz loud enough for them to hear, and a purpose for them to believe in – THEY WILL COME! Next was the selection of vendors. I knew I wanted to keep it small and cozy that’s why I didn’t shout out for vendors, I just invited them personally. Artists, designers, yoga instructors, engineers, teachers, my vendors came from all kinds of different backgrounds – all wearing the common hat of “mums” and an underlying passion for their second careers! For some of them who had just started with their small businesses this was their very first event so I had a big responsibility to shoulder. Being a vendor myself and having done events over the past two years I was conscious of the challenges and the possible pit falls. And that is when I knew that it had to be not just any bazaar but – a Bazaar with a difference! Next came the flyers -the most interesting and the most infuriating part of organising this event which challenged not just my creative buds but also my technological skills as I felt exhilarated and yet totally helpless trying to get things going on my brand new Apple MacBook Pro (a very dear gift from my loving husband). New software, new hardware, colour schemes, information to be included, vendor logos, white spacing and just when I thought I had conquered it all, arose the printing challenge! I didn’t know that what looked good on screen may not look good on paper! Now I had to think in terms of jpeg vs pdf, GB vs dpi, portrait vs landscape, flyer vs banner, phew! I spent one night giving it my all and only rested when it was over at 3 am! A night well spent as in the morning the printer finally approved all my files and layouts AND I felt wiser by a few years…couldn’t stop beaming that whole day! Last but the most most critical part of any event is the people – the visitors, the guests – the ones whose presence or absence would determine the success or failure of any event. I had to give this a serious thought. Besides my own friends and friends’ friends and the usual social media circles whom I planned to invite, I had a very special group in mind. I had started this group about six months ago on Facebook, as I had some specific queries in mind and was unable to find this niche audience. 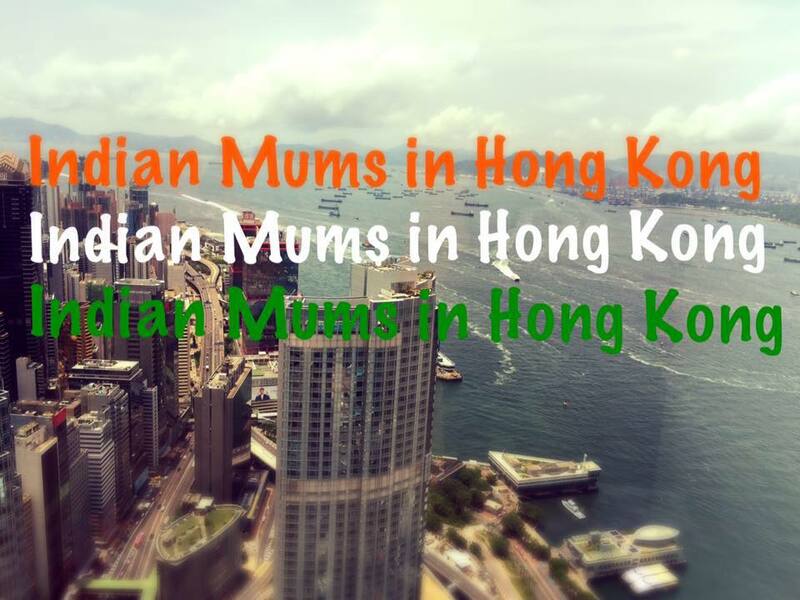 I called the group simply what it was meant to be – Indian Mums in HK. This group soon grew in numbers and I found myself spending more and more time on it, finding out about likes, dislikes, hopes and views of other Indian mums living in this city. It was unbelievable how we all started to know each other more and more through just an online medium. It is unlike any other online social group I’ve known. There is a vibrancy, a common thread, a deep-rooted compassion, an undefined spirit that bonds the members of this group together. Strangers who come from different parts of India, from different walks of life, from different religions and cultures seem to merge together to form a single unit. At our first group meet there were so many who walked in just by themselves, who were a bit quiet at first – fifteen minutes later they could be seen erupting into volcanoes of laughter, sharing jokes and exchanging contact numbers and eventually walking out in groups having made friends! I think I could write a whole new post about this “tribe” but coming back to the point, I combined our third Indian Mums in HK lunch meet with the bazaar! I wanted mums to come, mingle, chat, eat, shop and have lots of fun! And I wanted to do it while the kids are busy at school, hence the weekday and school hours chosen. I wanted it to be an event truly for the mums…by the mums! And it worked. The market opened at 10:00 and 10:15 onwards a steady crowd trickled in, kept us busy and tingling, till the mob swept in, and next when I saw the time it was 3:00pm! Day well spent, target well achieved, job well done. The Mums were truly at PLAY! And with that thought and a smile on my lips, I take a deep breath, close my eyes and surrender myself to sleep. Hey, Mehroo congrats for the new venture and I am sure it will be a blockbuster success. Thank you so much Uma! Hope you continue visiting!